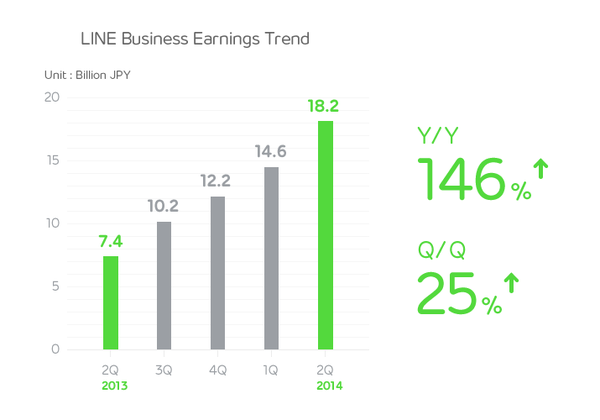 LINE Corporation, owner and operator of the free call and messaging app LINE, today announced their Q2 (April – June) earnings for 2014. The revenue for LINE Corporation’s core business, LINE, totaled JPY 18.2 billion in the second quarter, a 25% increase over the previous quarter and a 146% increase over the same quarter in the previous year. User numbers have continued to increase, with firm growth seen in the user bases of Southeast Asian countries, including Indonesia. In addition, LINE’s platform-based strategy has been successful in Mexico, Colombia, and other Central and South American countries, leading to even further increases in new user numbers and an overall expansion in worldwide use. The sticker business has witnessed the rapid growth of LINE Creators Market, a platform launched in April that allows users to purchase and sell stickers made by users themselves, as a new and unique platform for the smartphone age. LINE Creators Market, by providing a space in which users and creative artists can reach a global audience, as well as sell and purchase self-made stickers, has made it possible for the diverse needs of both users and creative artists to be met. Furthermore, the release of LINE Creators Market has also increased the pace of sticker localization efforts within LINE’s global expansion. This has resulted in over JPY 150 million in total sales from LINE Creators Market in the first month after stickers were made available for sale and purchase on May 8. Sales of paid stickers have also continued to excel, reaching an all new high for monthly sales since the release of the LINE Creators Market service, and particularly strong sales of animated stickers, launched in June, have driven overall revenue up.